The Protech Knives Godson 720 is a utilitarian, compact, every-day-carry version of the Godfather. It retains the classic design lines inspired by traditional Italian folding Stilettos. The Godson has the same American innovations as the Godfather. This is an automatic Stiletto featuring modern materials, high tech manufacturing, advanced coil spring mechanism, and quality American production. This Left Handed model of the Godson has a blasted finish, 154cm, plain edge blade and Black Hard Anodized aluminum handles designed specifically for left handed operation. 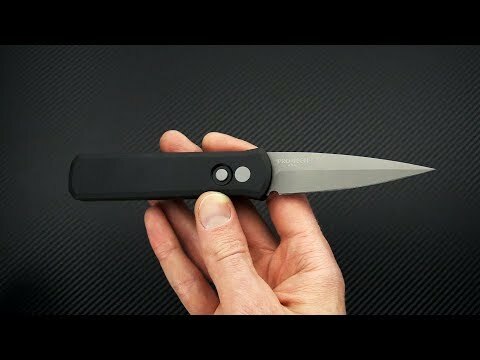 Brand new directly from Protech Knives, Made in the USA. Blade: The Godson comes with a more EDC friendly, 3.15" blade made of American 154cm stainless steel. There is plenty of cutting edge for utility work while still retaining the classic Stiletto lines. A nearly full length swedge makes for an exceptionally fine point that gives this knife some of the highest levels of piercing performance around. The blade has a blasted matte finish for discreet, low profile and non-reflective look. The blade deploys via a button operated coil spring mechanism that is fast and smooth giving you quick access when the seconds count. Handle: A contoured, coffin-shaped handle made of Black 6061-T6 Hard Anodized aluminum provides a comfortable in-hand feel in a variety of grips and deploys smoothly from the pocket for use. This is a highly utilitarian folder that is made for use. The matte finished aluminum will form its own unique patina with time and carry. The button lock mechanism provides reliable lockup and smooth operation. The button along with all other hardware has matching, matte gray blasted finish. The Godson carries securely via a single position, tip-up, right-hand, stainless steel pocket clip with blasted finish. 154CM: Crucible 154CM is an improved version of 440C with added molybdenum offering improved corrosion resistance and edge retention, as well as a higher level wear resistance.